STARS® is intended to engage and recognize the full spectrum of colleges and universities—from community colleges to research universities, and from institutions just starting their sustainability programs to long-time campus sustainability leaders. STARS encompasses long-term sustainability goals for already high-achieving institutions as well as entry points of recognition for institutions that are taking first steps toward sustainability. 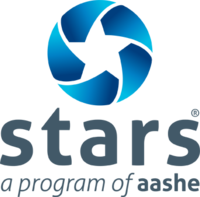 The current version of STARS incorporates feedback, suggestions, and lessons learned since the launch of STARS 1.0 in January 2010. While STARS is the most thoroughly vetted and extensively tested campus sustainability framework for North American institutions, it is by no means perfect. The current version of STARS is intended to stimulate, not end, the conversation about how to measure and benchmark sustainability in higher education. AASHE welcomes your feedback and participation in continuing to refine and shape the system.